Richard Gunn's notes offer a lucid contribution to the attempt of elaborating what is meant when the concept "class" is employed in Marxist thought. 1. It is much easier to say what, according to Marxism, class is not than to say what class is. A class is not a group of individuals, specified by what they have in common (their income-level or life-style, their 'source of revenue' , their relation to the means of production, etc.). The proletariat, for example, is not to be defined as a group 'as against capital'. Nor is a class a structurally and relationally specified ”place” in the social landscape (a place which individual may ”occupy” or in which, as individuals, they may be 'interpolated',  etc.). The difference between ”empiricist” and ”structuralist” Marxisms, which respectively treat classes as groups of individuals or as ”places”, is in this regard a trivial one. For want of a more convenient term I shall refer to the view which treats classes either as groups or as places as the 'sociological' conception of class. 2. Marxism regards class as, like capital itself (Marx 1965 p. 766), a social relation. That which is a relation cannot be a group even a relationally specified group; nor can it be a place (relationally specified place) in which a group may be constituted, or may stand. Setting aside such views, we can say that class is the relation itself (for example, the capital-labour relation) and, more specifically, a relation of struggle. The terms 'class' and 'class-relation' are interchangeable, and 'a' class is a class relation of some particular kind. 3. In other words: it is not that classes, as socially pre-given entities, enter into struggle. Rather class struggle is the fundamental premise of class. Better still: class struggle is class itself. (This is how Marx introduces 'class' in the opening sentence of The Communist Manifesto.) That 'class struggle' is intrinsic to 'class' is Marx's point when he stresses that existence 'for itself' – i.e. the oppositional, struggling existence – is intrinsic to the existence of class (Marx 1969 p. 173). 5. What qualitative forms can the structuring of lives by the capital-labour (once again, a relation always of struggle) take? The form to which Marx especially attends is that of exploitation/expropriation. Other forms include inclusion/exclusion (Foucault), appropriation/expenditure and homogeneity/heterogeneity (Bataille) and incorporation/refusal (Marcuse, Tronti): the list is phenomenologically rich, and open-ended. 6. One difference between the Marxist and the sociological views, as illustrated above, is that on the Marxist view the 'pure' worker (situated on the extreme left-hand side), whose social being is (unlike all the ”intermediate” figures) in no way divided in and against him or herself, is in no way methdolologically privileged. Neither is the 'pure' capitalist. Both, rather, are merely limiting cases and, as such, they are seen only as figures comingled with other in a diversely-structured crowd. The sociological view, on the other hand, treats the 'pure' worker and the 'pure' capitalist as methodological pillars between which the web of intermediate classes is slung. 7. The difference is important because, acoording to Marx, the 'pure' worker does not exist. This is not at all because of a relative decline in the numbers of the ”traditional working class” (however this theoretically suspect group be defined). On the contrary, it is because the wage relation itself is a bourgeois and mystifying form (Marx 1965 Part VI): whoever lives under its sign – even, and especially, the fully-employed producer of surplus-value -lives a life divided in and against itself. His or her feet remain mired in exploitation even while his or head (which is tempted to construe this exploitation in terms of ”low wages”, i.e., in terms which are mystified) breathes in bourgeois ideological clouds. 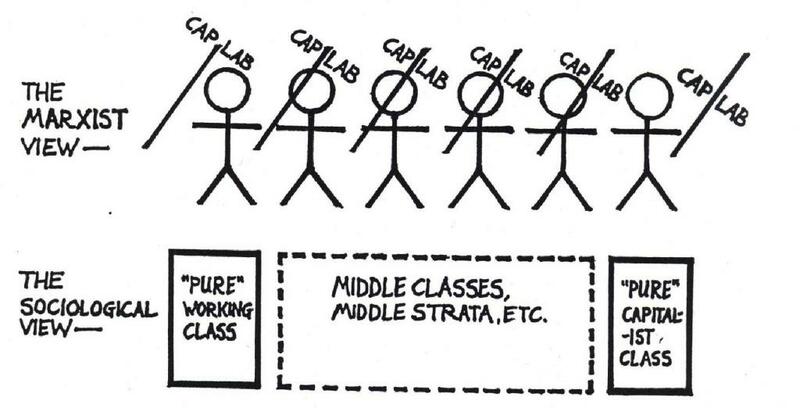 Accordingly, the line of class-struggle runs through the individual by whom surplus-value is produced (as with, say, the figure standing second-to-the-left in the diagram in para. 4, above). Here, again, there is no embarrasment for the Marxist conception of class which is interested in the specific ways in which the capital-labour relation structures, antagonistically, particular lives. But the non-existence of a proletariat in all its purity can only bring the sociological conception of class to the ground. 8. A further evident difference between the two schemes is that the Marxist one speaks of a single class-relation (namely, the capital-labour relation) as obtaining in existing society whereas the sociological scheme acknowledges as many such relations as there are possible link-ups between social places or groups. For this reason, the 'sociologists' accuse the 'Marxists' of reductionism. In fact, it is against the sociologists themselves that the charge of reductionism may properly be brought. The sociologists want to situate each individual, unequivocally and without remainder, in one or other of the specified groups or places: a ”cross categorial” individual cannot be allowed to appear in the picture which the sociologists draw. The point of the sociologists' proliferation of middle classes, middle strata, new petty bourgeoisies, etc., is to find some pigeon-hole to which each individual may be unequivocally assigned. Hence precisely the ways in which, in class terms, individuals are divided in and against themselves – the numerous and complex ways in which the geological fracture-line of class struggle lies through and not merely between individuals – enters theoretical eclipse. Hence sociologists' reductionism. The Marxist conception of class, by contrast, brings experiental richness of this (self-)contradictory life-texture into full theoretical and phenomenological light. The charge that Marxism reduces the lived experience of individual subjectivity to a play of impersonal and sheerly objective ”class forces”  is least of all applicable when 'class' is understood in its authentically Marxist sense. 9. A related point is that the Marxist conception, unlike that of the sociologists, does not construe class in terms of the bearing of this or that social role. From his early essay 'On the Jewish Question' onwards, Marx castigates, as alienated and unfree, any society wherein role-definitions (or a ”social division of labour”) obtain. Far from inscribing role-defintions as a methodological principle, the Marxian view of class depicts the individual as the site of a struggle – of his or her own struggle – which brings not only the ”universal” (role-bearing and socially homogenous) but also ”particular” (unique and socially heterogeneous) dimensions of individuality into play. Neither in theory nor in practice do role-definitions such as ”proletarian” or ”bourgeois” (or indeed ”man” or ”woman” or ”citizen”) represent Marx's solution; on the contrary they figure as one among the problems which 'class' in its Marxist designation is intended to resolve. 10. As between the Marxist and the sociological conceptions of class yet another area of difference is, of course, political. The sociological view advertises a politics of alliances between classes and class-fractions: moreover it ascribes to the 'pure' working class a privileged – a leading or hegemonic – political role. No question of such alliances arises on the Marxist view. Nor does the 'pure' working class (the employed as opposed to the unemployed, the direct producers of surplus-value as opposed to the ”indirect” producers, the proletariat as opposed to the lumpenproletariat, those whose labour does not) have a politically any more than a methodologically privileged place: for no such ”places” exist. Nor is there any question of ascribing to ”rising” as opposed to ”declining” classes a monopoly of revolutionary interest or force: such specifications only make sense when classes are seen as places or as groups. Finally, the whole notion of a vanguard party (plus its diluted variants) is overturned since the distinction between ”advanced” and ”backaward” class-elements disappears along with the sociological conception of class itself. In sum: what has traditionally passed as 'Marxist' politics is in fact sociological, and authentically Marxist politics amounts to politics in an anarchistic mode. 11. If classes are not groups or places but relations of struggle, then insofar as revolutionary conflict takes the form of a conflict between groups (but it always does this imperfectly and impurely) this has to be understood as the result of class struggle itself. It is not to be understood sociologically as, for example, an emergence of pregiven classes – at last! - into their no-less-pregiven theoretical and political 'truth'. The question before the individual is not on whose side, but rather on which side (which side of the class relation) he or she stands; and even this latter question is not to be understood as a choice between socially pre-existing places or roles. Not only quantitatively but also qualitatively, class struggle remains inherently unpredictable. The Marxian conception of class focuses sharply the issue of choice with which class struggle confronts us and in doing so it disallows appeal to any role or place or group in which (according to sociology) we already stand prior to whatever self-determining commitment we choose to make. It disallows this not least because it depicts us as torn by the force of the class struggle in which, in a class society, we are always-already consciously or unconsciously engaged. 12. Whoever wishes, can derive sociological wisdom from Marx's texts. Certainly, and especially in his political writings, Marx was not always a Marxist: for example the 'two great camps' conception of class espoused in the Communist Manifesto results from constructing the Marxist conception of class in an out-and-out sociological sense. Nonetheless, unless the Marxist conception of class were in fact Marx's the circumstance that Marx wrote Capital would be unintelligible. It was Marx himself who, long before his critics and revisionists, pointed out that as capitalism developed the numbers of the 'middle classes' could be expected to grow (Marx 1968 pp. 562, 573); and yet he writes a book, entitled Capital, in which a single class-relation (the capital-labour relation) is the theoretical 'object' addressed. This conundrum can be resolved only by taking his remark about the middle classes to be sociological, and by reading the main argument of Capital as Marxist in the above-specified sense. 13. The sociological conception of class, whenever it wishes to establish Marxist credentials, always becomes economic-determinist. This is so because the only ”indicator” of class-membership ('class', here, being seen as once again a place or group) which Marx's writings supply is that of a common relation to the means of production. Besides being related to the means of production, however, individuals are class-members (or who are class-interpolated) find themselves related to the state and to ”ideology” to say nothing about their local church or football team or pub. Hence, at once, the sociological conception of class generates a schema of discrete social 'levels' or 'practices' or 'instances' (Althusser) and must address the question of how these levels are related. The answer is well-known: in the last instance 'the economic movement...asserts itself as necessary'. In the last instance, in other words, sociological Marxism amounts to an economic determinism with, to be sure, long and complex deterministic strings. To claim, as Althusser does, that such a theory (because of its complexity) is no longer economistic is like claiming that a machine is no longer a machine in virtue of the number of cogwheels its motor drives. 14. With the Marxist conception of class, everything is different. Marx's distinction between class 'in itself' and 'for itself' is to be taken as distinguishing, not between societal levels (cf. Footnote 5, above), but between the sociological and the Marxist conceptions of class itself: if a class only becomes such when it is 'for itself' then political struggle with all its unpredictable ramifications and developments and expenditures is already built into what sociological Marxism treats as the economic ”base”. Whereas sociological Marxism attempts to unite levels which it assumes to be discrete, and on the basis of this starting-point and problem can only upon causalist and external relations of however 'structural' (Althusser) a kind, Marxist Marxism moves in the opposite direction and draws distinctions within a contradictory totality, i.e. within an internally and antagonistically related whole: 'The concrete is concrete because it is the concentration of many determinations, hence the unity of the diverse (Marx 1973 p. 101). As diagram in para. 4 makes clear, the totality of the class-relation which is specific to, for example, bourgeois society (the capital-labour relation) is present – wholly present, though in qualitatively different ways – in each of the individuals who form that society's moments or part. The essential thing was said long ago by the early Lukács: 'It is not the primacy of the economic motives in historical explanation that constitutes the decisive difference between Marxism and bourgeois thought, but the point of view of totality' (Lukács 1971 p. 27). 15. Along with 'the point of view of the totality', a wholly novel conception of class politics is brought into play. Once ”politics” is seen (as it is by the sociologists) as a discrete social level the litmus test of the existence of class 'for itself' becomes the formation of a political party of a more or less conventional – which means: a bourgeois – kind. Seen thus, even a vanguard party amount to a variation on a bourgeois theme. However it is not Marx, but rather bourgeois society, which distinguishes between the levels of political state and civil society – cf. 'On the Jewish Question' – and prescribes the former as the arena wherein social groupings in their maturity (which is to say their conformity) may compete. The Marxist conception of class, or in other words 'the point of view of totality', rejects precisely the narrowness of the conception of politics which the sociological conception of class entails. On the Marxist view, the category of politics becomes as wide as the forms which class struggle (and thereby class itself) unpredictably takes. Not merely is no issue excluded from the political agenda; the notion of political agendas is itself excluded since any such agenda excludes and marginalises whatever does not fall within some theoretically pre-established political domain. 16. The above notes claim neither to completeness nor to the provision of a defence at all points of the conception of class which they have attempted, schematically, to restate. Rather, their aim has been to make clear something of what a Marxist understanding of class entails. As regards evaluation of this understanding: the suggestion may be hazarded that the only possible line of critical questioning which seems fertile is that which asks whether the capital-labour relation is the sole such relation of struggle which, in all its richness, structures our lives. And here there can be no question of supplanting Marx: other such relations (sexual and racial relations, for example) are mediated through the capital relation just as, for its part, it exists as mediated through them. Inquiry as to which such relation is ”dominant” remains scholastic unless embarked on in concretely politcal (which is also to say phenomenological) terms. Both politically and methodologically, the great superiority of Marxist over the sociological is that it frees Marxism from every taint of the determinism which Marx castigated as amongst the most murderous features of capitalism – the tyranny of 'dead' labour over 'living' labour, or in other words of the past (as in all deterministic schemes) over the present and the future – and to which from start to finish his best thinkin stands implacably opposed. This is so because the single theme of Marxian ”class analysis” is the finely-textured and continually and uninterruptedly developing struggle which, for Marx, is the existence of class per se. This paper owes much conversation with John Holloway. Filio Diamanti made me realise that my understanding of 'class' required clarification before discussion of it could even begin. 1. This much at least is clear from the final, fragmentary, chapter of Capital vol. III (Marx 1971 pp. 885-6). 2. Marx (1969) p. 173. 3. Cf. Althusser (1971) pp. 160-5. 4. See Foucault (1979) Part Four, ch. 2; Bataille (1985); Marcuse (1968); Tronti (1979). 5. The view that the ”ideological” mystification inherent in the wage-form leaves the class-purity of the worker uncontaminated depends on treating production and ideology as discrete social 'levels' or instances; so too does the reading of Marx's distinction between class 'in' and 'for' itself which is rejected in para. 14, below. On the notion of 'levels' see para. 13. In passing, it is worth noting that the conception of ideology as a discrete level (however specified) remains wholly mysterious, if only because social existence without remainder – for example gender distinctions, architecture, work-discipline and scientific knowledge – carries with it an ”ideological” charge. 6. For a discussion of this charge see Sartre (1963). 7. Engels to J Bloch September 21-22 1890 (Marx/Engels n.d. p. 498). Althusser's distinction between 'determining' and 'dominant' instances represents a permutation of the same theme.